I hope our incoming president is the most successful in our nation's history. I want him- no, I need him- to succeed. These are tough times and surely every reasonable citizen is pulling for our new leader. Nevertheless, I was irritated earlier this week by the framed Obama campaign posters on the wall of an upscale Lawrence cafe. I want a respite from politics while I'm talking shop. The political position of a restaurant's staff is a pointless distraction. I don't care how you voted, but I suggest you keep it under wraps if you want me to continue buying expensive coffee. Such a disappointment. I remember when they merely had the original art from the Get Up Kids' "Red Letter Day" on their walls. Actually, it was the robots from "Something to Write Home About." Or maybe they just really, really want you to know which way they lean. Who knows? 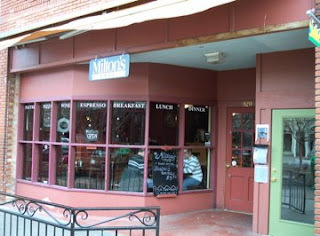 Ah, I miss Milton's. Great place and you're right. There has to be an escape from politics somewhere.